Daniel Burnham, born on September 4, 1846, was known as one of the world’s first urban planners, influencing the cities of Chicago, Cleveland, San Francisco, and Washington, D.C. He was also known as an architect, creating some of the original skyscrapers. But the achievement he is most remembered for is the World’s Columbian Exposition. Large-scale fairs of this type were known as “world’s fairs.” The first exposition of this type was held in London in 1851 in the Crystal Palace. It was such a resounding success that both France and America hastened to imitate the idea. Of these, the 1889 exposition in Paris was one of the most impressive, featuring the famous Eiffel Tower among other wonders. The World’s Columbian Exposition was originally intended to be a celebration of the 400th anniversary of Columbus’s discovery of America. Americans wanted to mark the year 1892 by outdoing the French. Previous world’s fairs in the United States had often been small, poorly managed affairs, although the Philadelphia Centennial of 1876 had attracted 8 million visitors. Still, what was that compared to the wonders the French had achieved? Planning began in 1889 when the United States House of Representatives set to work to choose a city to host the World’s Columbian Exposition. The four major candidates were Chicago, St. Louis, New York, and Washington, D.C. After lengthy debates, on February 24, 1890, the House gave the honor to the rail hub of Chicago, provided that the city could raise sufficient funds. Every prominent business and businessman in Chicago raced to collect the money, and later that year the goal was met. Chicago was officially declared to be the site of the Exposition on December 24, 1890. The directors of the event had high hopes. After the impressive fair in Paris, they felt that they must prove to the world that America could be a leader in progress. They must prove that the nation was no longer young and restless, but refined. For this reason, the purpose of the Exposition would be educational, and technology would be a major emphasis of the exhibits. To portray the culture and advancement of America, the Directory turned to Daniel Burnham. Burnham quickly gathered America’s top architects to help him design the buildings for the Exposition. He had a dream of creating a beautiful city for the event, and, with the help of the other architects, set about turning Jackson Park on the shores of Lake Michigan into the Exposition grounds. Marshy, neglected Jackson Park was transformed by decorative waterways and then filled with buildings. To demonstrate a refinement similar to that of Europe, Burnham chose to build the White City—about 150 buildings constructed in classical style. The outlier was the Transportation Building designed by young Louis Sullivan, who rebelled against the notion of imitating ancient styles and preferred to showcase America’s ability to innovate. Since one of the goals of the Directory of the Exposition was to surpass the Paris World’s Fair of 1889, Burnham looked for other creative ways to outdo the French. In response to the Galerie des Machines, an impressive exhibit space that had received much attention in 1889, Burnham and his architects created the Manufactures and Liberal Arts Building. This marvel of architecture measured 1,687 by 787 feet and was the largest building ever constructed at the time. It would serve as the main exhibit space of the fair, showcasing the goods of countries from around the world. For a final touch, Burnham had to find an invention that could rival the Eiffel Tower, originally constructed for the Paris World’s Fair. He challenged his team to come up with an idea, and George Washington Ferris presented a unique contraption—a giant wheel that people could ride on! The new Ferris wheel became a prominent feature of the midway. Workers constructed the many buildings of the fair as quickly as they could, but the undertaking was too monumental to be completed in time for the 400th anniversary of Columbus’s discovery of America. Opening day was postponed until May 1, 1893. 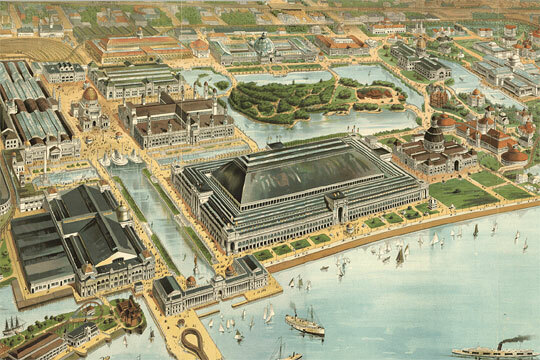 The World’s Columbian Exposition ran for six months, from May through October. Over 27 million people came to see the wonders on display during this time. And there was much to see, too. All the latest innovations in technology were presented. Manufactured goods from around the world appeared on display, often for sale. Foreign countries filled a Palace of Fine Arts with the best they had to offer. The various departments of the United States government presented exhibits, as did a wide array of businesses. Little wonder that many fair-goers often went home feeling rather overwhelmed! But the effects of the World’s Columbian Exposition were observed long after the buildings were pulled down. This spectacular event sparked a number of similar large-scale fairs, most notably the 1901 St. Louis World’s Fair and 1915 Pan-Pacific Exposition in San Francisco. It provided the inspiration for Antonin Dvorak’s New World Symphony and L. Frank Baum’s Emerald City. It brought Columbus Day and Harry Houdini to public prominence, and introduced many to the power of electricity. In a sense, it bridged the gap between the business-driven Industrial Revolution and the science-focused modern era. Burnham had big plans for the 1893 World’s Fair. The ripples still affect us today. Simple biography from the Library of Congress’s site for kids. Biography and blueprints from the ArchiTech Gallery in Chicago. A history of the World’s Columbian Exposition held in Chicago hosted at the University of Virginia. Find out what happened to it! A preview of a video that aired on PBS. Descriptions hosted at the University of Virgina. You’ll also want to visit Part 2. Interactive map of the fairgrounds. Public domain work containing photograph plates. Public domain account of the history and details of the fair infused with photos. “Biography” of the first Ferris wheel told by a favorite author — his last book. “It was the moon shot of its time, a great wheel 270 feet high, from the ground to apex, 1,700 tons of steel to lift thirty-six cabins the size of trolley cars — with velvet seats and floral carpets…. Would it get off the ground?” Captures the enormity of the Chicago World’s Fair of 1893 and the spirit of the times. Winner of the 1958 Newbery Honor. Chapter from Great Cities of the United States by Gertrude van Duyn Southworth that covers Chicago’s origins through the great fire. Lesson plan from The Newberry Library where students get to be Burnham and develop a comprehensive plan for holding a fair in their city. Extensive 175-page download at DePaul University geared toward 3rd graders with five lessons covering historical choices and current conditions. Extensive 90-page unit at DePaul University includes a unit planner and vast recommended resources; requires essays, analysis, and design; and culminates in an exhibition. Aimed at 8th graders, but adaptable either way. Map of the fairgrounds at the University of Virginia for notebook. Arial view of fairgrounds at the University of Chicago for notebook.